Home > Lifestyle > What Languages Should Children Be Learning To Get Ahead? The languages children learn in school might not be the most useful for their future. There are 7,099 known languages in the world today. 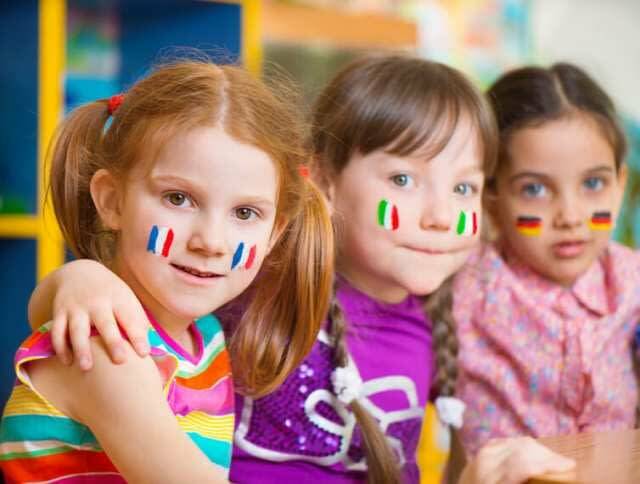 Choosing which of these to teach our children as a second language is an important decision, but one that may be based more on feelings than facts. There are several different ways of thinking about what languages we should offer at school. Research suggests that Australian school children may not be studying the right ones. If sheer numbers of speakers is our primary consideration, and we want our children to learn languages that have the most speakers, then – excluding English – the three most commonly spoken languages are Mandarin (898 million), Spanish (437 million) and Arabic (295 million). If the focus of language learning is to improve business prospects, then one strategy would be to select those that are spoken in the fastest-growing emerging economies in the world. At the beginning of the millennium, the four big investment countries were seen to be Brazil, Russia, India and China. The mood seems to have swung, however, and a recent report of top emerging economies now lists the top three as India, Indonesia, and Malaysia. Thus the top three would be Hindi, Indonesian and Malay. English remains firmly at the top of the list of languages useful for travel (spoken in 106 different countries). Other than English, the languages spoken in the highest number of countries are Arabic (57), French (53) and Spanish (31). This is the only list on which French, a popular choice with Australian students, is included in the top three. Australia’s top two-way trading partners are China, Japan, the US and South Korea. Excluding the US – a predominantly English-speaking country – the top three second languages from a bilateral trade perspective would be Mandarin, Japanese and Korean. Another way to consider importance is to think about the languages most commonly spoken as second languages where we live. This can be measured at various levels. 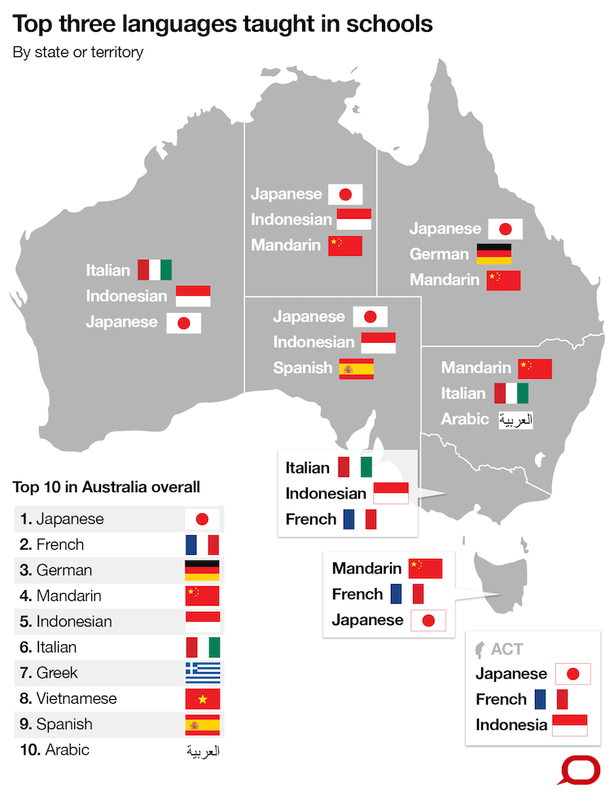 The top three second languages in Australia are Mandarin, Italian and Arabic. So how does our list of possible “best” second languages line up with the languages that are actually studied in Australian schools? Of the ten “best languages” we have identified on our various lists, seven are in the top ten languages studied in Australian schools. However, three – Hindi, Malay and Korean – are not studied widely. And three of the most commonly studied languages in Australia – German, Greek, and Vietnamese – are not on any of the top three lists. There are a number of historical reasons that may explain this disparity between the two lists. Greek and German, for instance, were historically important second languages in Australia. Now the communities that speak these languages in Australia are much smaller in number in comparison with communities that speak Mandarin and Arabic. Our languages education has not kept up with changes in demography. Japanese is another interesting case in point. It is the most commonly studied language in Australia. The push for Japanese in schools began in the late 1970s, gaining momentum with strong government funding in the 1980s. During the years that have followed, South Korea has moved up into the fourth position in bilateral trade. Despite government funding in 2008 to promote learning Korean, along with Chinese, Japanese and Indonesian, this has not resulted in strong numbers studying Korean at schools in Australia. Again, languages education seems to be having trouble keeping up. Who decides what languages to offer? In Australia, each state has jurisdiction over which languages to offer in their schools, and so the regulations differ slightly. In Queensland, for example, the Department of Education and Training instructs principals to make decisions about the choice of language, in consultation with their school communities. Part of the complexity around making these decisions is that it takes many years to train school teachers who are capable of teaching languages. Therefore it is difficult to respond quickly to changes in demand for different languages to be taught at schools. One innovative Australian project addresses this issue by recruiting elderly migrant language tutors with local school students, meeting the need for competent language tutors, and having the added bonus of providing these migrants with the opportunity to feel they are making meaningful contributions to their new communities. Another project which began in the US uses digital technology to pair up students as peer tutors: each student is a fluent speaker of the language the other is trying to learn. The effectiveness of this and other digital strategies have not yet been fully investigated in the Australian school context. Given the rapid changes in the status of languages across the globe, it is critically important to regularly review the languages that are offered and promoted to students at schools and to explore innovative approaches to these languages. In this way, we can maximise the opportunities for children to learn languages that will be of practical advantage to them into the future. Correction: This article was updated on 27 March to change the word used to describe the language spoken in Malaysia from “Malaysian” to “Malay”. This is the term used by the UN, and it was seen to be more accurate.